The Houston Methodist Research Institute is making mini brains from human stem cells that put researchers on a fast track to repair the nervous system after injury or disease of the brain and spinal cord. Houston Methodist neuroscientist Robert Krencik, Ph.D., and his team have developed a new system to reduce the time it takes to grow these brain models, which will give them the ability to screen drugs and study what's behind disease-causing mutations more quickly. Their findings are described in an article titled "Systematic three-dimensional coculture rapidly recapitulates interactions between human neurons and astrocytes," in the Dec. 12 issue of Stem Cell Reports. "We always felt like what we were doing in the lab was not precisely modeling how the cells act within the human brain," Krencik said. "So, for the first time, when we put these cells together systematically, they dramatically changed their morphological complexity, size and shape. They look like cells as you would see them within the human brain, so now we can study cells in the lab in a more natural environment." And why is this important? Krencik says cells grown in traditional lab cultures are put on a flat petri dish, broken up and otherwise manipulated, disturbing their interactions. This results in not being able to reproduce the form, structure and developmental growth of the brain's cells in the lab, leading to very simplistic-looking and immature cells. In the human brain, however, these cells are very complex-looking and interact in intricate ways with each other and the environment. New technologies are now focused on 3-D culture systems, but the exhaustive time for these studies is not feasible for accelerating discoveries. "Normally, growing these 3-D mini brains takes months and years to develop," Krencik said. "We have new techniques to pre-mature the cells separately and then combine them, and we found that within a few weeks they're able to form mature interactions with each other. So, the length of time to get to that endpoint for studies is dramatically reduced with our system." Krencik's lab focused on a star-shaped cell type called astrocytes, because they are a key factor in getting the brain's neurons to connect and talk to each other by helping to increase the number and strength of neuronal connections in the brain and spinal cord. They are involved in most neural diseases and also are responsible for maintaining a healthy nervous system. 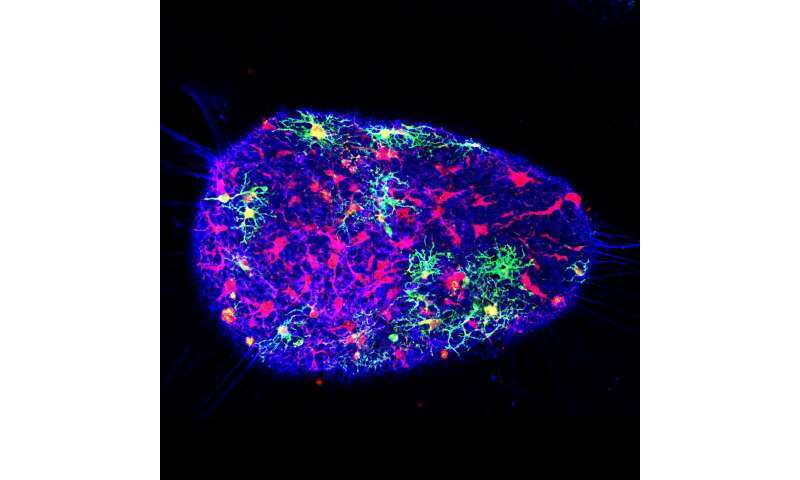 With the model Krencik's team bioengineered, the incorporation of astrocytes accelerated the connections of the surrounding neurons. Krencik's group is the first to specifically engineer astrocytes into these 3-D mini brains. By doing so, this led to the accelerated maturation of both the astrocytes and the surrounding neurons. Introducing them for the first time in this paper, he coined these bioengineered mini brains "asteroids" to distinguish them from other types of 3-D sphere cultures, known as organoids. Krencik's "asteroids" contain specific populations of astrocytes, whereas organoids have undefined numbers and types of cells. "Using our system, we can generate mature astrocytes and have them interact intimately with neurons to a greater extent than has been done before," Krencik said. "Unlike other cells in the brain and in the rest of the body, astrocytes have unique properties in humans. It's thought they are partly responsible for the unique cognitive functions of humans and also may underlie aspects of human diseases, such as Alzheimer's and autism spectrum disorders." Ultimately, Krencik is using these "asteroids" to form functional neural circuits that researchers can experimentally manipulate for developing treatments and deciphering what makes diseases tick. Krencik says they can make induced pluripotent stem cells, commonly termed iPS cells, from any disease or patient and then form these mini brains to study the disease process, as well as screen therapeutic compounds on them to aid in the development of drugs. Within about five years, his goal is to use this system to develop clinical trials to improve or regenerate a person's impaired nervous system.